The internet's #1 website for Targeted Individuals. We are a Civil Rights Group. We are a 501(c)(3) non-profit organization committed to exposing and ending the Targeting Program through public awareness, education, and both federal and local legal actions for Targeted Individuals. Targeted Justice has received many emails and communications recently. 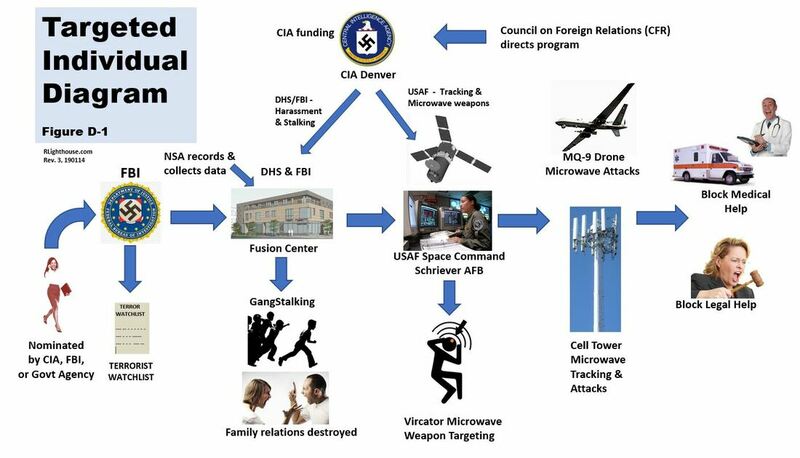 Many people have been severely abused by the Directed Energy Weapons lately, and this has strained our resources - please be patient while we catch up. Thank you for your continuing support and efforts. Targeted Justice has a membership that consists of Targeted Individuals and the people and groups that support our efforts. We currently have more than 1,678 members that have indicated their support for education, public awareness, and the pursuit of legal action. Even if you are not a Targeted Individual, you can join our membership and support our efforts. If you would like to add your name or volunteer with our team, please contact us. For Membership, please read the Membership page. There should be 3 images below this text. If you do not see them, some content is being blocked - please contact us. You can save these diagrams to your computer by Right-Clicking and "Save Image As". Sworn Affidavit of FBI Special Agent, Geral Sosbee. Mr Sosbee is a Texas attorney and has documented his ordeal on his website at SosbeeVFBI.com Mr Sosbee confirms that the FBI is involved with organized gangstalking and Directed Energy Weapons. This affidavit is valid in any courtroom. Sworn affidavit of Ted Gunderson, former FBI Chief. Mr Gunderson confirmed the FBI's involvement with organized stalking and the Targeted Individual program. This affidavit is valid in any courtroom. "The allegations in the complaint are true and correct: Defendants (NSA and US Govt) are intercepting, accessing, monitoring, and storing the Plaintiff's private communications. I have knowledge of this information, based on the following facts..."
Dr Daniel Lebowitz, M.D. - Presentation submitted to a Senate Hearing, December 2014. This is an excellent introduction about Targeted Individuals. 14 April 2019: UN Convention Against Torture can help Targeted Individuals. Article 12 - Government authorities must conduct an investigation. Article 14 - Each Government must provide fair compensation to victims of torture. 7 April 2019: Massive Corruption at the Pentagon. GAO report states that 95,613 Pentagon whistleblowers filed reports between 2013 and 2018. 19 February 2019: The CIA & State Dept have requested that the National Academy of Sciences (NAS) review the cases of the Cuban and Chinese diplomats. 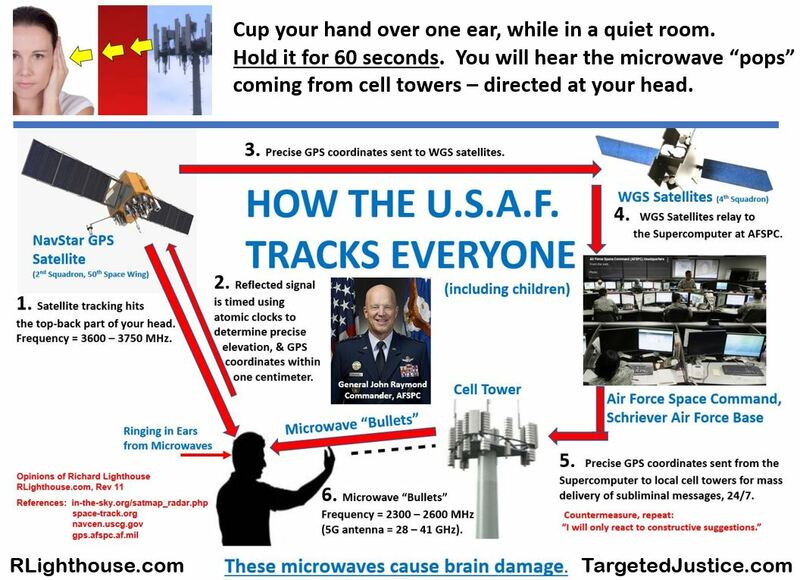 It is the opinion of Richard Lighthouse, that this panel will attempt to whitewash and coverup these CIA-directed microwave attacks, just like the Warren Commission covered-up the murder of President Kennedy. 12 February 2019: Targeted Justice sends Cease & Desist Letters to the FBI and DOJ. John C. Demers, DOJ; Jay Tabb and Charles Kable at the FBI have been sent official Cease & Desist Letters. See the tab - Cease & Desist. We encourage TI's to forward a copy of the letter to all FBI agents (first.last@ic.fbi.gov) and your elected officials. 20 November 2018: "U.S. officials tell NBC News they're considering the possibility of an electromagnetic weapon, possibly involving microwave technology ...the concrete medical findings prove that something harmed workers." See our TECHNOLOGY tab for details about the microwave pulse weapon called a Vircator, built by the Titan Corporation. 15 August 2018: FFTI has a media campaign to spread awareness about the growing crimes of organized stalking and directed-energy weapons. FFTI (www.freedomfortargetedindividuals.org) has already put up a variety of media, including billboards, train wraps, and platform posters in Los Angeles, Boston, and Vancouver, BC. Thanks to Ella Free and the team at FFTI. 29 June 2018 – Lab tests on flyers that were placed on vehicles belonging to Harris County Sheriff’s Office employees on Tuesday have yielded no evidence of Fentanyl, a dangerous synthetic opioid, according to The Harris County Institute of Forensic Sciences (HCIFS). We continue to be dismayed about why the Sheriff's office would lie about touching Fentanyl. 28 June 2018: Targeted Justice responds to the media. Please see our Official Statement to the Press in the pdf file above. Note: Dr Jeremy Faust, MD at the Harvard Medical School has stated that Fentanyl cannot be absorbed by touching it. Many statements by the Harris County Sheriff's Office have been false and misleading. 6 June 2018: D-DAY; Targeted Justice invades the Deep State. 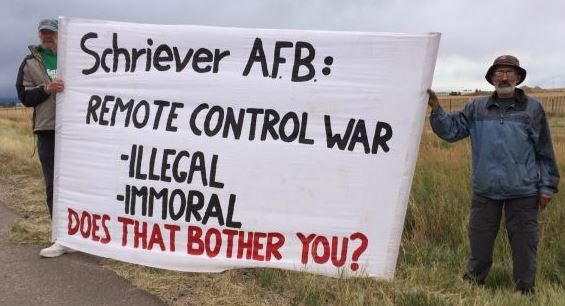 Four volunteers successfully invaded the Deep State operations at Air Force Research Labs, and Raytheon KTech in Albuquerque, using protest signs and handouts. Website traffic jumps to an average rate of 30,000 page views each month. See the CONTACT page for more contacts and organizations. 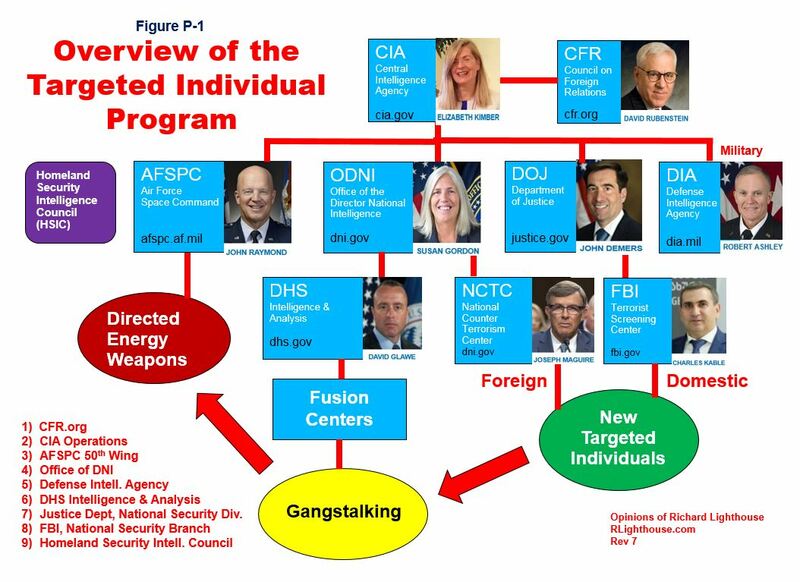 Dr Peter Dale Scott, Professor - "The American Deep State"
"How the Secret Government Works"
Through threats, bribery, and blackmail - these four criminals control Congress, the CIA, FBI, and DHS. The CIA double-crossed the CFR many years ago, but they are just now learning about it. Reference: "The American Deep State" by Dr Peter Dale Scott, Professor at UC Berkeley. Dr Douglas Smith, M.D., Univ of Penn. We are still early in this process.